Medieval (mid 14th to 15th centuries) book clasp of Howsam type A.1.3. The copper alloy clasp is composed of two components; a rectangular plate and a perforated clasp element. The rectangular strap mount component is a sheet of copper alloy which has been folded over the axis bar and the corners cut off to narrow it slightly at the fold. There are two rivet holes in the centre of each plate. The under plate is narrower, shorter and incomplete. The upper face of the plate is decorated with a double-stranded rouletting of addorsed triangles, forming a border. The perforated clasp element has a rectangular loop ending in a bar that projects slightly beyond the rest of the clasp. It is semi-circular and flat, with a central circular perforation, and is decorated with similar double-stranded rouletting forming a border. At the apex there is an integral, incomplete knop through which there is a incomplete circular aperture running from side to side. The surface of the book clasp has an abraded mid to dark green patina. It measures 40.77mm long, 22.3mm wide and 3.92mm thick. It weighs 8.9g. The clasp would have been used in conjunction with leather straps to keep books closed when not in use. Egan (Egan 1998) illustrates similar clasps, for example No. 919, and comments that this clasp was found in contexts dating from c. 1350 to c. 1400. 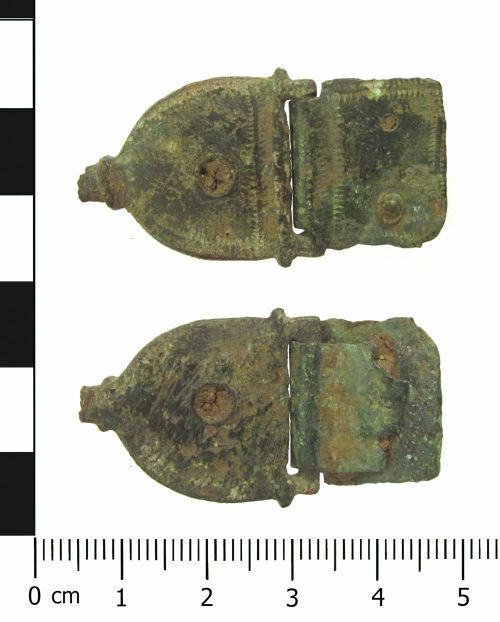 Ottaway and Rogers (Ottaway and Rogers 2002) illustrate similar sized clasps, Nos. 15236 and 14641 in particular, and these were found in late 14th to 15th century contexts. Ottaway and Rogers (2002, 2937) comment that these types of mounts are found on ecclesiastical and secular sites but these types may be more associated with books related to ecclesiastical business (2002, 2939) even when discovered on secular sites. Compare HAMP-D3A2EB, which has similar decoration.